I'm not sure if I have spelt that right! The horse/owner I am looking for had a stud in Crewe back in about 1997ish. I went to look at a colt of hers and didn't buy but she was my 1st 'proper' introduction to the arab world and was so friendly and lovely I'd love to speak to her again. She also owned the most beautiful black stallion and (then) yearling black filly (imported from Egypt) but the only horses name I can remember is Kharibe who was grey and the colt I went to look at was blue and beautiful! Diane Jeffries stud was in Styal Cheshire and not Crewe are you sure you have got the right town??!! 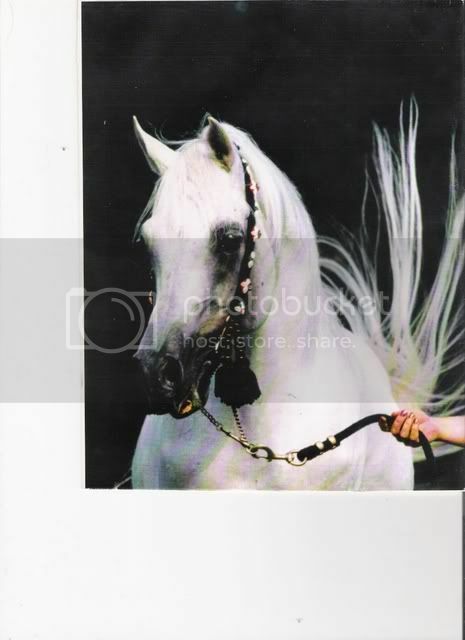 She did sell the horses on though most to Elysium Arabians but I think Kharibe was gelded and sold prior to her dispersal. For some reason I think he ended up Blackpool/Lancashire way???!!!!??? Diane hasnt got any horses anymore and I am sorry I dont have a contact number or anything for her. black mares by El Kabah. Is Style near Manchester? 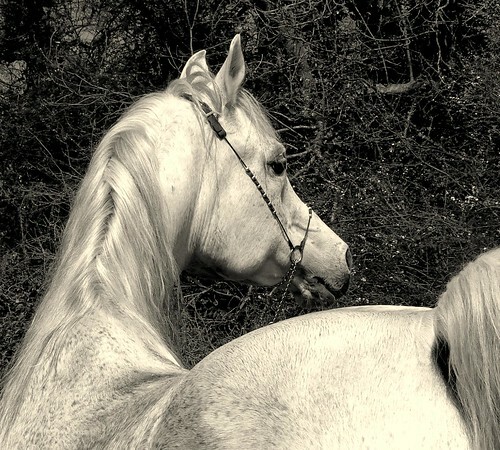 Omar sounds right for her black stallion....he was stunning. What a shame she has stopped breeding, her horses was lovely and she was so so friendly. I had been warned that 'arab people' were an insular bunch that didn't welcome outsiders but she made me feel so welcome and was so, justifiably, proud of her horses that I was hooked! She also had a lovely attitude to her stallions (I think she had 3), they were all kept amongst mares and had turnout and were just treated as horses! It was very refreshing after my experience with thoroughbreds. There was a hunter type gelding who lived next door and when she turned Kharibe out for me to see him showing off this huge, chunky gelding next door came prancing over with his tail up copying him, it was so lovely. Diane suffered a lot after losing her partner, nursing him through his illness took its toll, and it was with great reluctance that she decided she needed to start afresh. We were made just as welcome even in her sad situation, and yes she did have some gorgeous horses. My little foal Alileo is by a stallion bred by her, by CAS Sabur, out of Shaliah, who is by the tiny and typey El Kabah out of the very regal Royal Georgina. She is one of the old style breeders, keeping generations of home bred to perfect her ideal. Yes Styal is not far from Manchester in fact next door to the Airport. 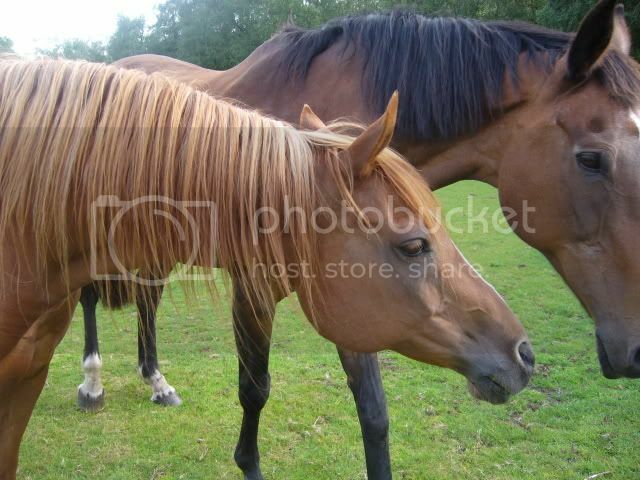 my Gelding (Kazbah) pictured in my profile (chesnut flaxen mane and tail) She looked after my mare like she was her own and yes thats partially why I chose to send my mare there because I knew she would be treated like her own and looke after. But yes, we were always made welcome by her and she loved all her horses dearly. 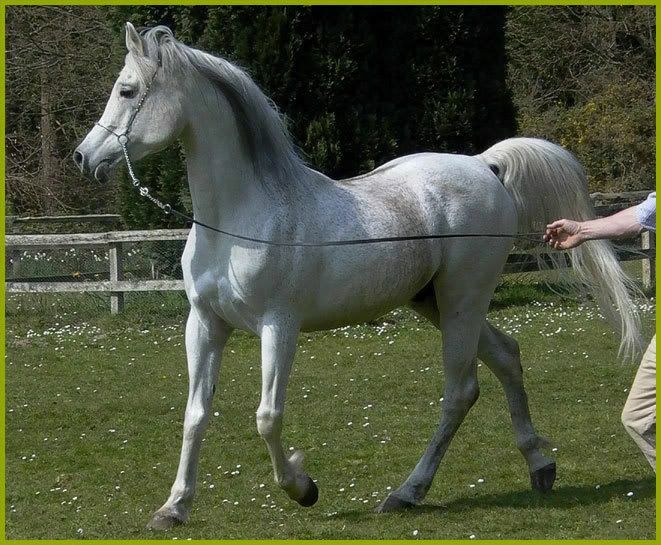 The stallions she had at the time were :- El Kabah, Kharibe, Omar el Sireff and Shai Pasha and a few colts. My gelding, Kal, is also by El Kabah out of Kazminta so he's half bro to Kharibe and Kazbah, he's nearly 18 now. I think it was Fairview Arabians the name of the stud owned by Diane Jeffries. There was an article or editorial on the stud in that Arabian Link mag that used to be around commemorating El Kabah's 21st birthday so if anyone saved copies of it, there might be something in whichever issue it was in. I've been looking to see if I could find it because I'm sad and like saving stuff relating to my horses!!! Thanks for all your replies. What a shame that life threw such a deal at Diane, I hope things are wonderful for her now. I'd just like to thank Diane for the wonderful introduction to the Arab world that she gave me. If you can post piccies please put a photo up of Kal, I would love to see him. This is my lad by El Kabah taken last summer, he is by Bazz-Swirl my mare, she is very closely related to Kazra. Thanks rachael it will be lovely to see him. Kazbah used to have a shocking blonde mane when he was younger, his tail is still very blonde but his mane went ginger a few years back. but my printer is playing up so cant do it at the moment will do after Xmas. Oh WOW, Thank you Hannah. My brain is working now and I should have said Shai Pasha had been gelded, dont know why I said Kharibe!!!! He looks lovely and looks very well He has a lovely head. Kharibe is in Hampshire now? Where? Can I go and visit him again? He's lovely and him and Diane really started my love of arabs. I was also privileged to meet Diane Jeffries many years ago when I went to see all her beautiful horses. Many were sold to Lisa Dunn at Elysium Arabians. I bought a mare called Shahlizia (Kharibe x Nazriwa by Shakhs)), and raced her but sadly she was too slow and is now doing endurance and RC activities in Devon. I bred a filly out of her who I still own Laihana Zayin, who I am doing endurance on this year. Lovely to see these horses again, El Kabah was stunning and Kharibe had the most incredible head I ahd ever seen and its nice to see a recent pic of him. Dianne bred some wonderful horses and was always very welcoming and helpful to me in my early days. 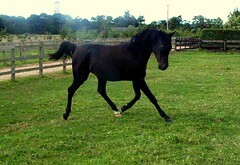 Pat ww - is it the Shaliah that is a little black mare with the most extraordinary expression? If it is the same the one I know belongs to Lisa and is in her 20's now. Gorgeous little thing. Just to keep every body up to date. kharibe has now passed on after spending his last two years with two mares running free in 10 acres of grass strutting his stuff,but after a while his health was failing him . this year i have a Anglo filly and an Irish sports horse filly by kharibe to end the legacy that kharibe has left us. i am sorry it is not better news. Oh No Abby I am so sorry. One of my reasons to use El Kabah on my mare was when I saw Kharibe, I fell in love with him and also Shahliah and Shahma, I thought if that what El Kabah produces then I will use him. As a mtter of interest I found an old VHS tape and on it was an open day Diane Jeffries had and I took some video footage that day and I watched it last night and Kharibe and all the others where on it. So sorry to hear about him anyway, sounded like he had somelovely years with you running free with mares. thanks janet for your kindness. would love to see the tape one day, perhaps i could pay for it to be put on to CD, would make a great present for my husband, would loved him to bits,?? so sad to lose any horse, kharibe was a truly lovely example and its good to hear he has offspring to fly the flag for him.